Our love of detail shows in the feathers of these wings. 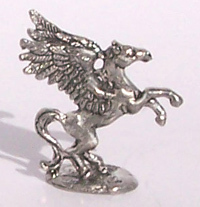 The pegasus has just reared up on his back legs, ready to take flight. We make it by hand from lead-free pewter.